Trading: Please Trade, Stop the Pinsanity! Discussion in 'Pin Trading' started by Xanaduhaz, May 23, 2013. Okay so I am addicted to pins and trading and may have a few too many traders so theres only one thing for it, lots more trading! "Help a fellow pin trader today. There are many pin traders, waiting to trade to the right person, it CAN be you. Without regular trading it can lead to a serious condition; resulting in mass hoarding, obsessive organising and occasional dreaming about pins. Below you are about to witness a hoard of items, waiting to be sent to a home near you. Only your ‘pintervention’ can help. 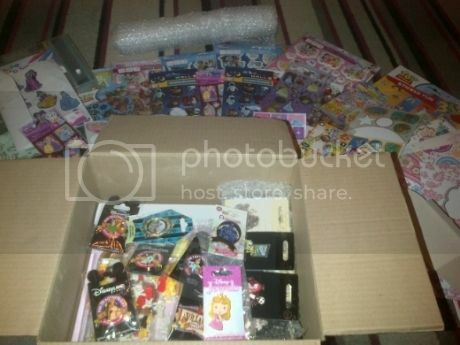 *Above is the collection of stickers, writing paper, pins, bubble wrap etc waiting to be used. If you would like to trade pins plus a decorated card / letter to help reduce this pin trader’s hoard of Disney related stickers, all you have to do is trade. Also check out sparkle_ballerina's wants, she collects Minnie in other character outfits, mostly princess outfits and ballerina inspired pins. Love the post and also love your pins... If I had your wants I would love to help the campaign!!! Awww! I wish I had something to trade with you! I am tired of all the "for sale only" signs! I also collect stickers! *. * I have so many! I think stickers can be worse than pins at times! I'm afraid we don't have any matches, but I just had to say this is the cutest trade request post I've ever seen. You put a smile on my face at the end of a long day; thanks! We have a few matches. Please PM me if you are interested. Romancing_Train EVERYPONY calm the buck down! you have my most wanted Jasmine pin! Think I have caught up on all replies (Apologies if I have missed any one out) so far so lets continue with the pinsanity!!! melanium Pin Trader from the Future! You have a Wall-E pin I want, but I have no Trade Matches for you! Sorry I can't help with you with your illness, lol! I don't have anything from your wants... Have fun trading! I have 2 pins you want...but the pin I want is not an even trade. Maybe we can work something out? I'm always up for a fair trade! Well, I have been away to DLRP since I last bumped this thread, so new traders woop!!! Ack!! You have the Jasmine in Sand Timer pin! *drooooooool*!!! Man I'd really love that one but we don't have equal matches :/ This is an awesome thread though, good luck on your trading! Have fun! We love 3 of your pins, could you look at our traders? Again I apologize and hope to starting trading on this thread again soon, but slowing down whilst I sort everything out. Here is the reviving post of my thread. Look forward to sending a trade to a mail box near you!!! I love your OP! I look forward to trading with you in the future! The promise of a handwritten note and cute stickers is wonderful! If you or know someone who has the Brother Bear Beloved Tales for trade please let me know as was one of the pins I am gutted I missed out on.